He captured hearts around the world with his bright, beautiful eyes that appeared to be full of life. Unfortunately help for him came too late. 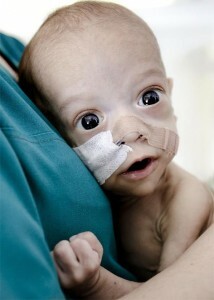 Born with stunted intestines, baby Andrei lost his fight on Thursday at the tender age of 9 months. In April, following an Associated Press article, people in Europe and the United States began offering funds and medical expertise to help the Romanian baby get a complicated intestine transplant needed to save his life. The surgery, which was performed 10 days ago, was too late. His doctor, Dr. Catalin Cirstoveanu said his condition deteriorated after the procedure. Dr. Cirstoveanu was in talks with doctors in the U.S. to get Andrei a transplant. Our thoughts are with this couple and the staff who grew to love Andrei while he was in their care in the ICU. Knowing the teen parents were low on resources, many of the nurses had even participated in a lottery to raise money for his operation. It makes me wonder whether it would’ve been better to leave him as he was and let him go naturally or risk this surgery which is what truly lead him to his death — he couldn’t have been feeling good in those last 10 days 🙁 🙁 🙁 A horrible way to go, all mangled and cut up. I guess from what I have read he was not gaining weight so he needed the surgery. It is incredibly sad considering the amount of press he received all over the world. Could not one specialist have flown over to help? Heart breaking.